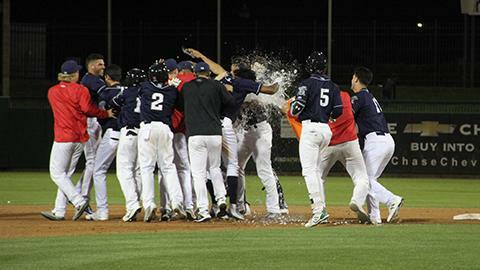 MODESTO, Calif. - For the first time in 2019, the Stockton Ports are winners of back-to-back games. The Boys of Banner Island took advantage of three Modesto Nuts fielding errors to score three early runs in the first and doubled up their lead on one swing of the bat by Austin Beck later in the contest as they earned a 6-2 victory at John Thurman Field. Nuts starter Nick Wells (0-1) was victimized by his defense early. With one on and nobody out in the top of the first, Lazaro Armenteros hit a double-play ball to Nuts shortstop Johnny Adams. Adams had the ball go under his glove and into left field. Subsequently, left fielder Jack Larsen overran the ball and allowed Armenteros to take an extra base, putting runners at second and third with nobody out. Beck came up for the first time and flared a double inside the right field line to score Nick Allen and give the Ports a 1-0 lead. Hunter Hargrove followed with an RBI single to left to make it 2-0. Jeremy Eierman came up next and reached on a fielding error committed by third baseman Joe Rizzo that loaded the bases for Jonah Bride who cashed in a sac-fly to center to make it a 3-0 contest. The Ports doubled their lead in the fifth with Beck's first home run in a Stockton uniform. Wells gave up a single to Mickey McDonald to open the inning and, two batters later, walked Armenteros to put two aboard. Wells was then lifted for Reggie McClain who surrendered the three-run homer to Beck upon entering, making it a 6-0 contest. Wells would suffer the loss, going 4 1/3 innings and allowing five runs (three earned) on four hits while walking two and striking out two. Ports starter Wyatt Marks (1-1) would turn in a solid effort and pick up his first victory of the season. Marks, working with a lead from the get-go, spun five scoreless frames while scattering three hits, walking three and striking out three. Joel Seddon, who was added to the Stockton roster prior to the game, pitched in a Ports uniform for the first time since 2015 and was brought in to work the sixth. Seddon would scatter three singles in the frame, the last one coming off the bat of Eugene Helder to score Cal Raleigh and give Modesto its first run of the series. Seddon stayed on to start the seventh and issued back-to-back walks to open the frame. At that point, Sam Sheehan was summoned, and he issued a walk to Larsen to load the bases with nobody out. After Sheehan struck out Raleigh, Rizzo reached on an infield single that brought in a run to make it 6-2. Sheehan, though, would escape further trouble by getting Anthony Jimenez to bounce back to the mound for a force out at home plate and striking out Luis Liberato to end the inning. Sheehan pitched one-plus inning and allowed two runs on three hits while walking two. Sheehan worked an inning-and-a-third scoreless while allowing one hit, walking two and striking out three. Peter Bayer worked the final 1 2/3 innings of the game for Stockton and allowed one hit while striking out four while not issuing a walk. The Ports and Nuts play the third game of their four-game set on Saturday night at John Thurman Field. Xavier Altamirano (0-1, 15.00 ERA) makes the start for Stockton, opposed by Modesto southpaw Ray Kerr (0-1, 13.50 ERA). First pitch is set for 7:05 p.m. PDT.